Locke wrote this one! He’s playing through Final Fantasy IX. Or rather, he’s playing the card game within Final Fantasy IX. I’ve been planning on playing FFIX myself, but I wanted to finish my play through of FF Tactics A2 first. I don’t even know how far into the game I am. It seems endless! 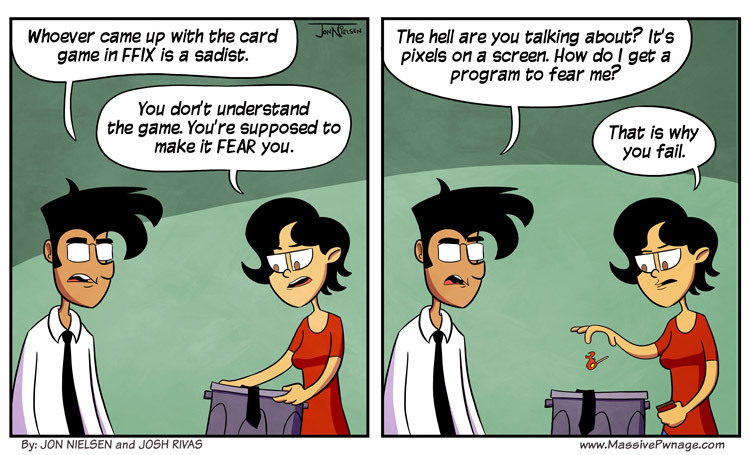 This entry was posted on Monday, March 26th, 2012 at 12:00 am and is filed under Comics. You can follow any responses to this entry through the RSS 2.0 feed. Both comments and pings are currently closed. Tika is probably just trolling him. As a programmer, I have to side with Tika on this. One must make the program fear you. And all will be well. I love Tactics A2! It’s one of my favorites! I agree it takes a while. What point are you at? Nice! I like him a lot. Ummmm what is Tika burning? Lockes clothes? I am both genuinely afraid and amused. burns lockes clothes everyday either because Locke wears new clothes everyday, or it turns evil after he wears it, right? or they are the clothes of evil alien substitutes. Did she just burn Locke’s clone? never thought of that, tika must be one badass to kill the clones and burn them in a trashcan ._.